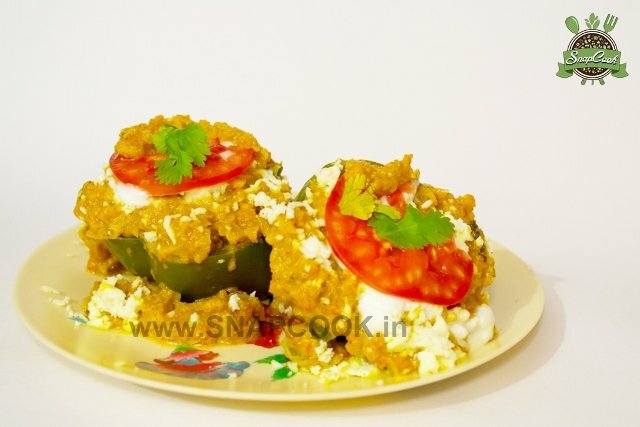 Bharwa Shimla Mirch (Capsicum Pasanda name given by me ) is a stuffed capsicum curry garnished with gravy. Heat oil in a kadai, add hing, jeera, rai and when they splutter add green chilly, mashed potatoes into it. Fry it and add amchoor powder, red chilly powder, salt and mix it well and keep aside. Now heat oil in same kadai, add hing, jeera and when they splutter, add onions. After 1-2 minutes, add ginger garlic paste and sauté for a minute. Now add tomato, haldi powder, dhaniya powder, red chilly powder, salt and sauté till it leaves the oil. Cool it and grind it in mixer for smooth gravy. Meanwhile, cored the capsicum and remove all the seeds. Put all the capsicum in pressure cooker and take little water into it and add some salt (1 teaspoon). Cook it for 1-2 minutes (when pressure forms in cooker, no need of whistle). Remove it from the cooker and keep aside to cool. Now place each capsicum in serving plate. Add onion tomato gravy all over it. Garnish it with paneer, tomato slice and fresh coriander leaves. Serve it with hot chapatis.